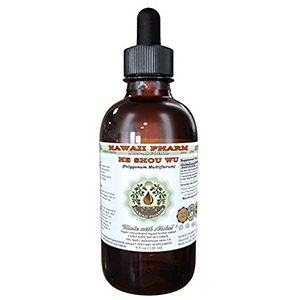 He shou wu, also known as fo-ti or Polygonum multiflorum, is classified as one of the premier major tonics in Traditional Chinese Medicine. It has been used for centuries as a Taoist longevity herb fundamental for increasing Jing and kidney Yin, the deep primordial stored life force that fuels all other energies. The Taoist philosophy of "internal alchemy" claims that preserving one's Jing is an essential component to prolonging one's lifespan. In today's modern fast paced world, many people are burning up this energy reserve at a rapid rate with the use of stimulants and excessive lifestyle habits that can over time cause adrenal fatigue and deep depletion of kidney Yin. 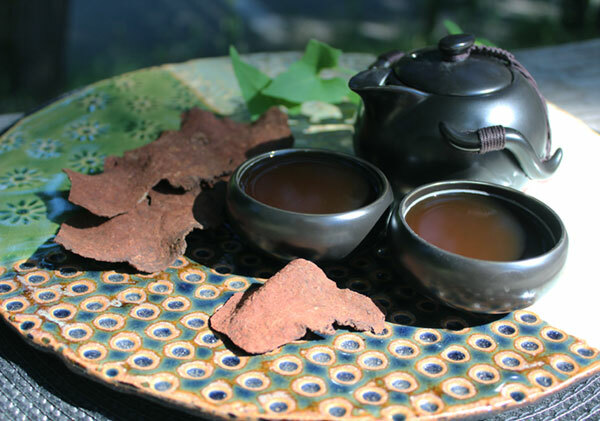 He shou wu teas and extracts can be especially appropriate in such instances for their restorative building properties that help to replenish what the Chinese consider to be the "root of our vitality" seated in the kidneys, the center of Yin and Yang for the entire body. 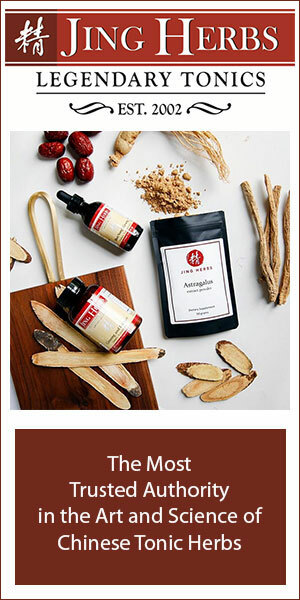 As one of the great herbal adaptogens, fo-ti possesses cumulative actions that are both energizing to the body yet calming to the nervous system. One of our personal favorite top superfoods, it additionally serves to tonify the liver functions, build the blood, fortify the muscles, bones and tendons as well as enhance sexual libido and fertility in both men and women. It is highly revered for its ability to encourage hair growth and slow down the effects of aging, including the premature graying of the hair. It is important to remember that when designing a tonic herbal therapy protocol, it can sometimes be appropriate to seek the guidance of a trained qualified herbalist who can more accurately tailor the most ideal formula specific to one's individual and unique health diagnosis. 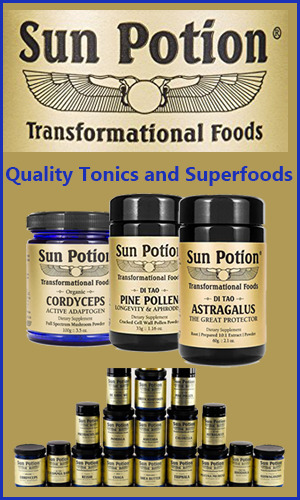 Tonic herbs, like fo-ti, are considered to be "foods" that are safe and most effective when prepared and consumed on a regular basis. The root has a distinctive sweet yet slightly bitter taste and a warming quality. 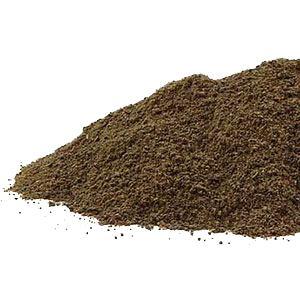 As a deep red-brown colored tea decoction, fo-ti has a rich robust flavor that is usually very pleasant to drink all by itself or can be incorporated with other tonic herbs. 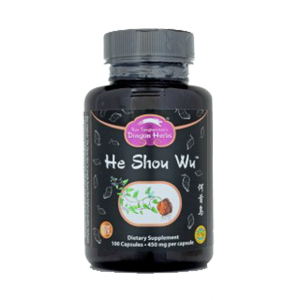 For convenience cured he shou wu is also available as a powdered or encapsulated hot water extract that can be added to drinks or taken in capsule form. It is also widely used in many pre-formulated extracts using different combinations of herbs specific for influencing certain health conditions. What is He Shou Wu? He shou wu comes from the species commonly referred to as Polygonum multiflorum, but also occasionally goes by the species name Fallopia multiflora. From the buckwheat or knotweed family Polygonaceae, it is native to mountainous regions of central and southern China but also grows in North America where it is known as fleeceflower root. He shou wu, the Chinese pinyin translation, is pronounced "ho (or huh) show woo" and is occasionally spelled "ho shou wu" for this reason. As we mentioned, it is also frequently referred to as "fo-ti" root, primarily in non-Asian countries. 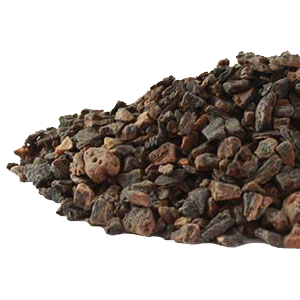 He shou wu is a vine-growing species, like schizandra, that is mainly utilized for its potent tuberous root. Most roots sold commercially are imported to other countries from China, which has been a prime habitat for growing fo-ti on a commercial scale for centuries. 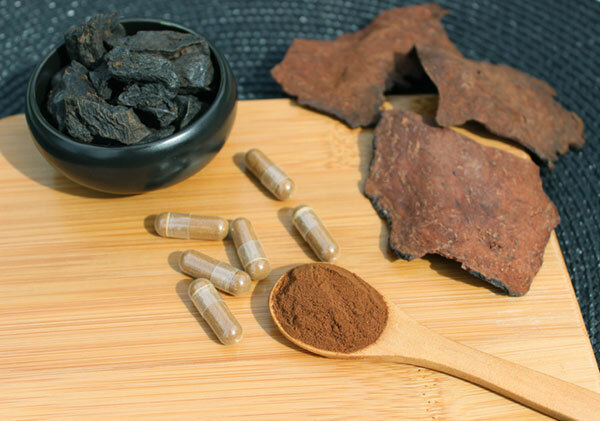 Fo-ti is well-known for its ability to concentrate an enormous amount of Chi (Qi) into its root system, which especially accumulates over a period of time. Because of this quality, it usually comes in different grades, such as "premium" or Grade 1 as well as "good" or Grade 2. The grading system is based on the age of the root. The smaller younger roots of 3-4 years in age are believed to be less potent than larger older roots of 5-10 years or beyond. Generally, the older the root the sweeter the flavor and higher the medicinal components. 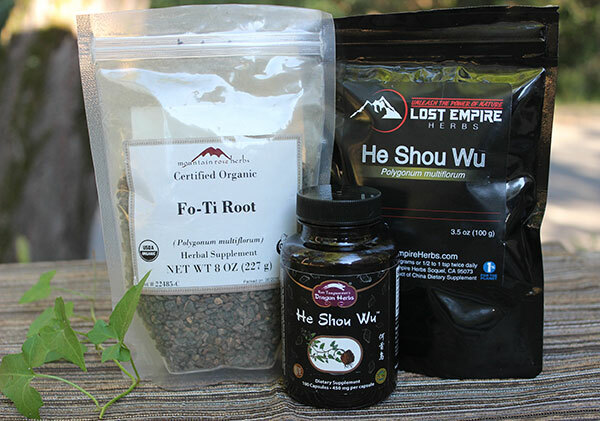 The two main forms of he shou wu are called prepared or "red fo-ti" and raw (unprepared) or "white fo-ti." It is very important to note that there is a very big distinction between prepared and unprepared he shou wu root. The one we are referring to on this page is the PREPARED variety. 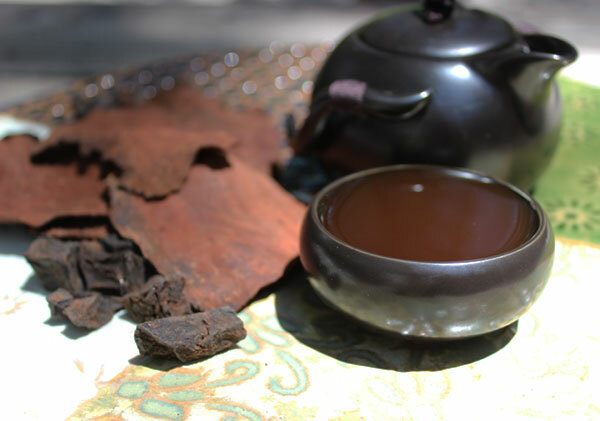 Prepared or "cured" he shou wu, refers to the traditional method used to prepare the root for use as a tonifying herbal substance which is then further decocted or tinctured. This preparation technique basically involves stewing the sliced raw roots in a black soybean broth for many hours, usually in accordance with customary Chinese standards. Additional procedures can also involve various steaming and drying techniques. This turns the roots a dark to medium black-brown color with a sometimes slight reddish pigmentation when thinly sliced, hence the name "red" fo-ti. This preparation process essentially decreases the conjugated anthraquinones and potential toxic components in the raw root and increases the free form anthraquinones that have many health-enhancing restorative properties. Again, this is the ONLY type of fo-ti we would recommend using on a regular long-term basis. Raw roots are "uncured", straight, dried sliced roots from fresh plant material and are typically a beige-light brown color with a firm texture. Unprepared fo-ti is NOT considered a Chinese tonic herb because of its laxative qualities and potential toxicity which can cause unwanted side-effects. It should NOT be consumed in large quantities or for an extended period of time. 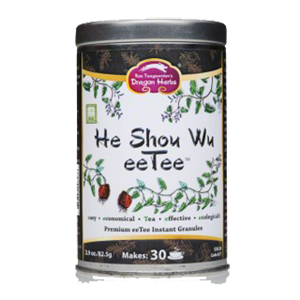 Prepared he shou wu, its decocted teas and extracts, have been utilized for centuries in Chinese herbalism as a premier Yin Jing tonic and "anti-aging" herb that can be consumed daily to support one's deepest stored energy reserve or Jing essence. Believed to encourage a healthy long life with prolonged use, the root is said to "help return an aging person to youthfulness and to keep a young person young." Jing, one of the three treasures, is directly related to "kidney Yin", often viewed as the fuel behind the fire of all life energies. Kidney yin naturally gets depleted as we age, causing drying of the skin, hair and tissues. We can also become prematurely deficient from ongoing stress, overwork and excessive lifestyle habits. A common herbal ingredient in numerous longevity preparations, he shou wu deeply nourishes and replenishes kidney Yin, also associated with the kidney-adrenal system and reproductive organs and glands. 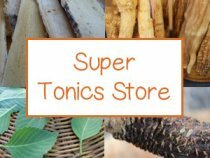 Major tonics, like he shou wu, are also considered adaptogens, a term which defines its ability to modulate immune and endocrine functions, ultimately decreasing the impact that various stress factors can have on long-term health. It is important to emphasize that the restorative herbs, like fo-ti, should not be considered a quick-fix for harmful lifestyle practices or over-indulgences, but are rather used as regular food-like substances that work most appropriately in conjunction with health promoting diet and balanced daily life. 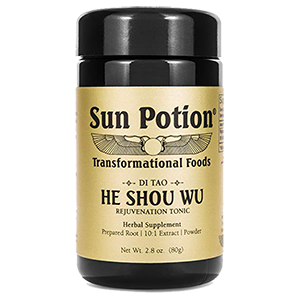 He shou wu or fo-ti root, when used as a prepared tonic herb consumed on a consistent basis is very well-known throughout the Orient for its ability to not only slow down the process of graying hair but in some cases can actually help to restore pigment. This property is closely related to fo-ti root's rejuvenating effects on the kidney-adrenal system and signs of gray hair are, according to TCM, usually an indication of depletion in this vital organ region. Although genetic weakness can play a part, an overly stressed lifestyle is also known to encourage premature graying and aging in general. 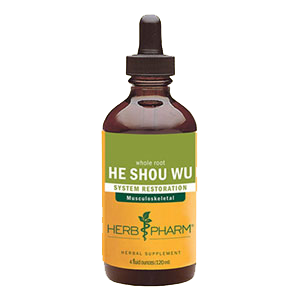 He shou wu is also a very well-known supplement to take for enhancing hair growth and is commonly used in tonic herbal formulations specifically for this reason. (*) This can be especially relevant to women in menopausal years who frequently experience hair loss as a result of hormonal fluctuations. Quality is very important when it comes to this particular herb. 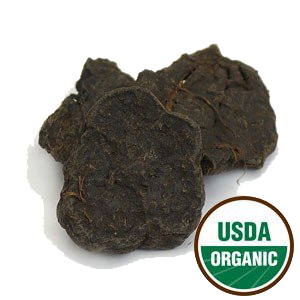 Older "premium" grade he shou wu roots are known to be more effective for hair growth and retaining one's natural color pigmentation. 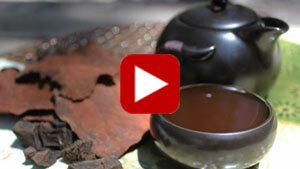 He shou wu is likewise considered tonifying to the liver and bloodstream as well as the kidneys. Prepared teas and extracts, according to Chinese herbalism, encourage protective effects to the liver organ as well as help to purify and build the blood. It is notably high in iron and lecithin, two dietary nutrients helpful for hemoglobin and red blood cell formation. 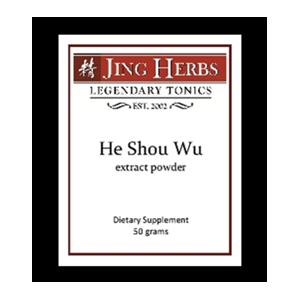 He shou wu is a primary herbal ingredient in the famous blood building Chinese patent formula known as Shou Wu Chih, also considered a longevity Jing tonic elixir. 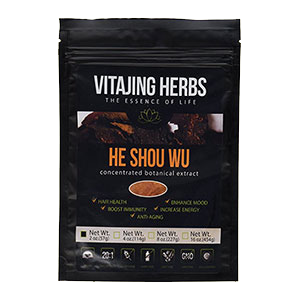 While prepared he shou wu has been utilized for centuries for its beneficial attributes and tonifying properties, raw unprepared roots and lower quality fo-ti products and patent formulas have been shown to be potentially toxic to the liver when used on a regular basis. Some of the scientifically isolated compounds thought to be responsible are especially found in the unprepared roots, which contain certain concentrated stilbenes or anthraquinones. One of the claimed benefits of ritual consumption of he shou wu brews and/or extracts includes its capacity at activating certain enzymatic antioxidants, particularly the anti-aging compound referred to as SOD or superoxide dismutase. SOD is one of the body’s principal internal antioxidant defense mechanisms known for its critical part in reducing oxidative stress and the effects of damaging free radicals. Fo-ti is additionally high in the dietary mineral zinc, which is required for the production of certain enzymatic antioxidants, like SOD. Zinc is also important for sexual and reproductive functions. 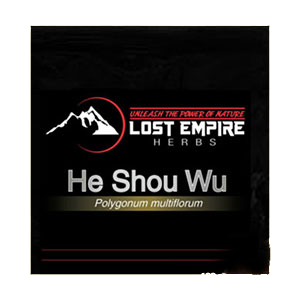 Lost Empire Herbs - Bulk powder; a 10:1 full-spectrum water extraction of prepared roots. Dragon Herbs - Organically grown, certified by ECOCERT, powdered extract (in capsule form) is from the highest grade of prepared roots; a 8:1 ratio. The eeTee granules are made via a raw extraction process from prepared roots. 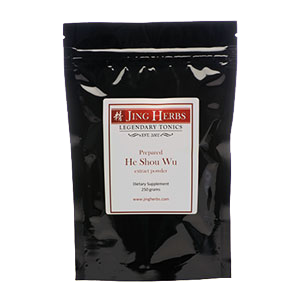 Jing Herbs - Hot water extract in bulk powder form made from prepared roots; a 10:1 ratio. Mountain Rose Herbs - Prepared organic fine ground powder and pieces, available in bulk quantities. Starwest Botanicals - Cured organic bulk root slices and finely ground powder. 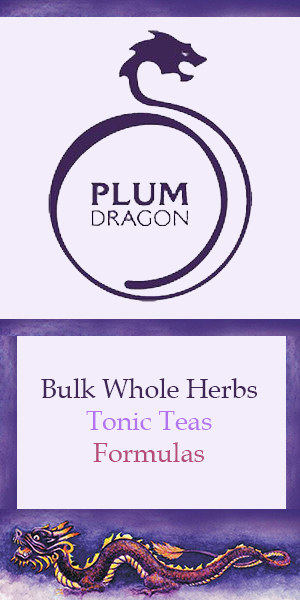 Plum Dragon Herbs - Grade 1 and Grade 2 options available as a prepared powder or chunk pieces. Vitajing Herbs - Powdered extract made from organic prepared roots; a 20:1 ratio. Herb Pharm - An 43-53% organic cane alcohol and distilled water extract of prepared roots and is purity verified. 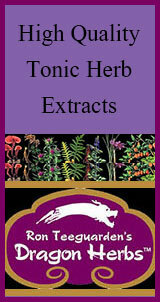 Tonic teas can be made in advance and consumed throughout the day for greatest health benefits. Dried prepared fo-ti is available in thin slices, chunks, pieces or in powdered form. All of these variations should be decocted (or simmered) in water for at least 20 minutes to an hour or more. Similarly, they can also be used to create homemade liquid extracts by infusing the macerated dried herb in alcohol for up to 2 weeks or longer. 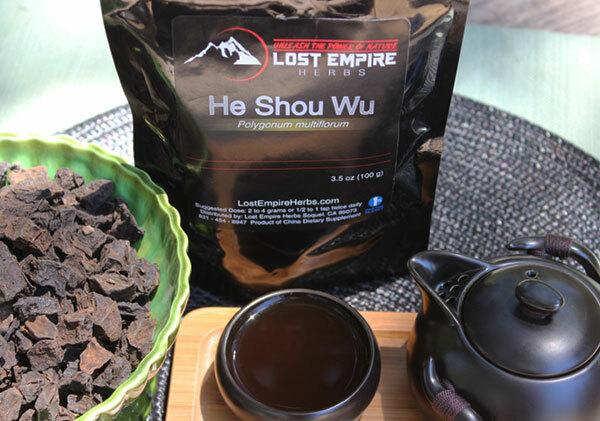 He shou wu blends very well with other tonic herbs like reishi, astragalus, Chinese licorice, rehmannia, dong quai, codonopsis and goji. As we mentioned, when taken as part of an herbal therapy program, it may be beneficial to seek the guidance of a qualified herbalist who can tailor the formulation to one's specific needs. Prepared fo-ti is very potent when used as a concentrated hot water extract. These are available as bulk powders or are encapsulated and can be added to teas, elixirs, shakes or consumed in capsule form. It likewise comes in liquid form, usually as an alcohol-based tincture. It is advised to follow the dosage amount on the product label as each has a different potency ratio. In our opinion, this herb has a strong yet very rich and robust earthy flavor that makes a delicious hot morning beverage. 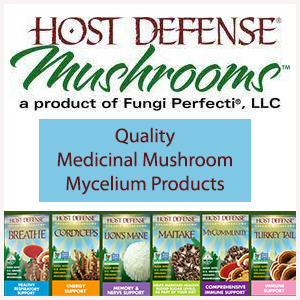 High dose amounts have been known to cause mild gastrointestinal disturbance, characterized by soft stools. 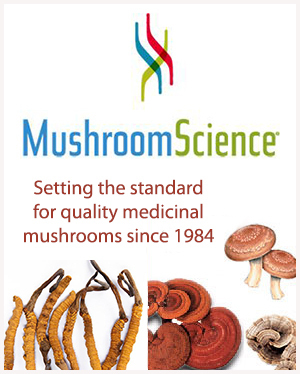 We advise consuming only "prepared" high quality purity tested roots, to avoid potential liver toxicity. Seek the advice of your health care practitioner if you have a serious medical condition, are taking prescription medications or are pregnant or breastfeeding.